In these grey, cold and damp early days of 2019 it’s nice to remember the warm sunny days of last summer – a summer which seemed to go on for ever, and one that had us all complaining about the heat. And last summer I was fortunate enough to play at four excellent and varied festivals: There was ShyneFest in June, Woking’s Party in the Park in July, Weyfest in August and finally Woking Food Festival in September. All were great experiences, and all were very different. So let me indulge myself with memories from all four. Shynefest was organised by my friend Shyne Adcock as a celebration of her birthday. I hadn’t been able to attend the first Shynefest a couple of years before, so this was my first experience – and it was great fun. And I was invited to do a set on the Acoustic Stage too. 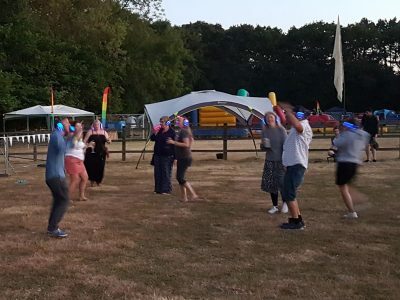 The festival started on the Friday evening with a silent disco – an interesting experience. But all the live music happened on the Saturday – alternating between the main stage for the bands and the Acoustic Stage for solo and duo acts. The weather was good all day and my set seemed to be during one of the hottest times of the afternoon. Fortunately there was a bit of shade under the cover of the stage. My wife took this video of one of my songs – Since You’ve Been In My Life. One week after Shynefest came Party in the Park. This is Woking’s annual celebration of music and dance, and it takes place in Woking Park. This year, the weather was superb – another hot sunny afternoon – so the crowds were large. I wasn’t playing on a stage as such, but I did two half hour busking slots at a couple of locations around the park. This year, as before, I stuck mainly to my own original songs – they seem to go down better than covers I’ve attempted in the past. I guess my familiarity with my own songs helps me give a better performance. And thanks to all the generous people who tossed some coins into my guitar case. By far the biggest festival I played in 2018 was Weyfest. 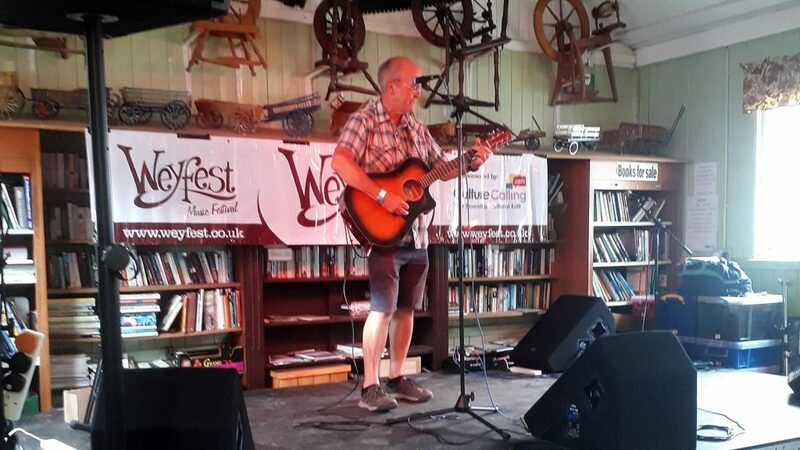 I was asked to play on the Rustic Stage which was curated by my friend Vic Cracknell, and I was given a half hour set on the Saturday afternoon. The Rustic Stage is not open-air – it’s in an old hut, with a stage at one end. However it holds quite a few people as I was to find out. Despite being on early I had a good turnout and the reception from the crowd (and their dogs) was very warm. Nick Blogs videoed all the sets on the Rustic Stage and he’s been kind enough to upload the footage to YouTube for us all to see. During my set I played the following songs – timings included. The links will take you to the start of the song in a new browser tab. Overall, this gig was a great experience – one I hope to repeat at some stage. Every year for one weekend, the centre of Woking is taken over by limitless food stalls and pop-up bars to celebrate Woking Food Fair. 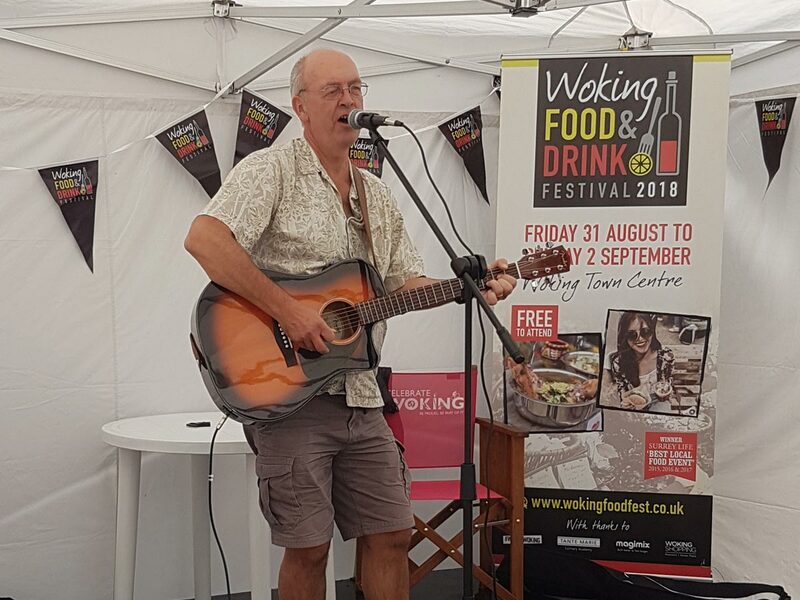 With the emphasis on food, it may seem a strange festival to mention here, but the Phoenix Cultural Centre in Woking are invited to organise busking for the event. And I was lucky enough to get invited to play a couple of slots – one on each of the weekend days of the festival. 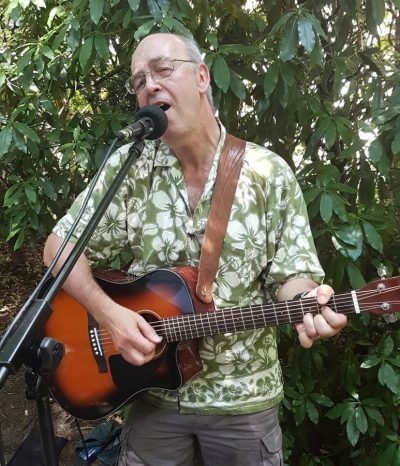 Much as with the busking at the Party in the Park (see above) I seem to do best when playing my own songs, so both of the sets consisted of all original songs. The weather was gorgeous on both days and after playing, I was happy to try some of the food on offer. I’ll be back performing again soon once I’ve finished recording the ‘Found My Way‘ album.